"Best" is a subjective term, but the Baguette Monge and the Baguette Malesherbes at Eric Kayser's Odéon bakery are excellent by any standard. 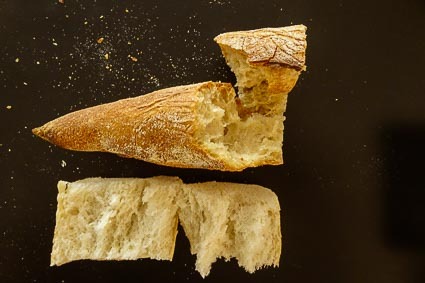 ABOVE: Eric Kayser's Baguette Monge has a lovely color and crumb, and the pointed ends provide extra crunch for crust lovers. TOP INSET BELOW: Cheryl Imboden poses with a baguette from Eric Kayser's Odéon bakery. Okay, before you beat me up, I'll confess: "The best baguettes in Paris?" is a clickbait headline. Still, it's a headline that, as a bread aficionado, I usually find irresistible whenever I'm searching Google or browsing through food blogs. And to be fair, the baguettes that I'm about to describe are certainly among the best baguettes in Paris, and (as Michelin might say) they're worth a detour if you're anywhere near the Sixth Arrondissement. Baguette Monge (on right), the loaf that made Eric Kayser famous, is the smaller of the two, with pointed ends. Baguette Malesherbes is slightly larger and more conventional in shape, and it's priced a few cents higher. Both loaves have a thick, crunchy crust and a marvelously chewy interior with plenty of holes from the natural fermentation process. My favorite is the Baguette Monge, because the pointed ends increase the crust-to-crumb ratio. The Baguette Malesherbes produces chunks or slices of a more consistent diameter, thanks to its more cylindrical shape, but you won't go wrong with either loaf. Eric Kayser has boulangeries throughout Paris (and even in such far-flung locations as New York and Kinshasa), but quality may vary slightly from bakery to bakery or even from day to day, depending on things like weather conditions and who's working in the back room. I can say that I didn't have one dud among the several dozen loaves that I bought at the Odéon branch. Your mileage or km/l may vary. Eric Kayser's croissants and other Viennoiserie are also wonderful, and they're no more expensive than the equivalent products in more run-of-the-mill boulangeries.